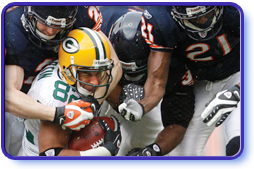 The Chicago Bears have always known that the best offense is a good defense. Here, a Green Bay Packers wide receiver is gang-tackled at Soldier Field. No one hawks merchandise like MJ. No one three-peats like him, either. This right hander won 29 games for the Cubs in 1908, their last championship season and also won a cool nickname. Playing left wing for the Blackhawks through the '60s his slapshot was clocked at 120 mph. Opposing teeth didn't stand a chance. Born in Norway, raised in Chicago, he became the most celebrated coach in college football history and uttered the immortal words, "Win one for the Gipper." With five Olympic golds, this Chicago lad was arguably the best U.S. swimmer in history; and certainly the best Tarzan.